Is the backlit Nook a Kindle killer? The Kindle proved that people will read books on tablets. The e-ink display is a pleasure to look at, and gone are the days of carrying around half a dozen heavy books on every vacation. But the current e-ink Kindles also come with a limitation of their medium - they aren't backlit and that means, like a normal book, you have to read with the lights on. There's something sweetly poetic about Barnes & Noble getting a leg-up on the Kindle. For all intents and purposes, the book store giant really should know books, and they adopted the GlowLight technology first. The backlight is a bit like a soft glow, that - despite the size - would probably bug your sleeping spouse less than a round of late night phone gaming. Though it's the most significant, the backlight isn't the only ace up this Nook's sleeve. The Nook Simple Touch offers insane battery life, and the GlowLight doesn't change that. With the light on, you can read for over a month of thirty minute reads on a single charge, or two months with no light. The Nook Simple Touch is seven ounces, which is just barely an ounce over the backlight-less Kindle 4. 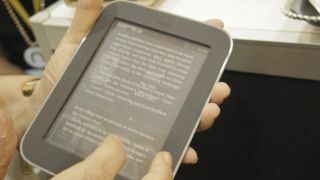 It features a more rounded approach than the Kindle 4, and two small ridges on its back make for ideal finger placement. Unlike the touchscreen Kindle 4, the Nook also features page forward and backward buttons, which are hidden beneath its plastic frame. Unlike the Amazon Kindle, Barnes and Noble offers you a wall charger and screen cover. It has a 2GB microSD card, with expandable memory up to 32GB. The Nook Simple Touch with GlowLight has preorders available, though they're temporarily out of stock. The new Nook will be available on May 22.